DINNER: Choose from the varied and enticing à la carte Dinner Menu, follow the Chef’s suggestions or embark on an odyssey of flavours with the Surprise Tasting Menu. The Wine List offers a carefully chosen selection of national and international wines, many of which are available by the glass. Ask our sommelier for his recommendations. 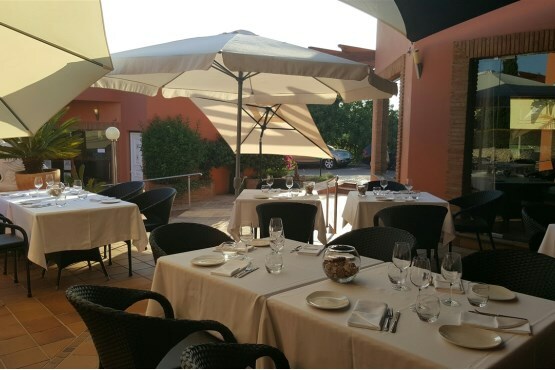 Hexagone Restaurant is locatedin Sesmarias, between the picturesque villages of Ferragudo and Carvoeiro, and close to the Pinta and Gramacho golf courses, and is open from Monday to Saturday for lunch and dinner. The restaurant is spacious and welcoming with high ceilings, large panoramic windows and an open kitchen where you can see the Chefs in action. The summer patio and terrace are perfect for leisurely lunches or al fresco dinners, while the spacious bar is ideal for a before or after dinner drink. In the winter, the dining room is cosy, thanks to the wood burning fireplace. We look forward to welcoming you to Hexagone Restaurant.